Whenever I visit audio shows, or hear new systems in other places, there are certain things that will always catch my ear. Full range drivers often appeal to me because of their directness and sweet, musical presentation. The flip side is that most of them don't produce much bass, even if they are mounted in large horn enclosures. Now that we're on the topic of enclosures: one other thing that always sounds good to me is a sealed enclosure. I've really never heard a ported speaker, or transmission line, that sounds as tight and precise in the bass as a sealed box, perhaps only with some very expensive exceptions. A port might produce more bass, but since it is just a resonator added to the driver it will also add some delays and other problems. A combination of these two properties would be great, but I didn't think a full range driver that worked in a sealed enclosure existed. Then SEAS introduced one last year, the Exotic F8. Actually, SEAS already produced full range drivers in the early 1950's, so it's not something new to them at all, but they do claim that their experience and modern laboratory development tools have allowed them to produce the most advanced full range driver available in the market today. The name Exotic is probably well chosen, as the main cone is partly made out of papyrus and the magnet is made out of Alnico, which has the reputation, in some audiophile circles, of adding magic to the sound. The Alnico name comes from Aluminium, Nickel & Cobalt, which are the main components of this relatively expensive magnetic material. The magnet is certainly small, which should help prevent the sound reflecting back from it. The driver is designed to give bass response from just below 50 Hz in a 60 litre enclosure, enabling a proper bottom end in a larg-ish floor standing loudspeaker. Because this bass is coming from a sealed box it should be very clean en well controlled, which usually makes it easier to add a subwoofer, if needed. The only problem with this attractive driver is that it is only available as that: a driver. No manufacturer has yet produced a loudspeaker with them, which means that if you want to try them you'll have to build your own speaker. Not an easy thing to do, but if you decide to do it anyway then a sealed cabinet is actually the easiest to build and using a full range driver is a huge advantage as well, since the crossover that is needed for a multi driver speaker is by far the most complicated thing in loudspeaker design to get right. Compared to that just putting a full range driver in a closed box is simplicity itself. My woodworking skills are minimal and I don't have a workshop, so I needed some help with the cabinets. 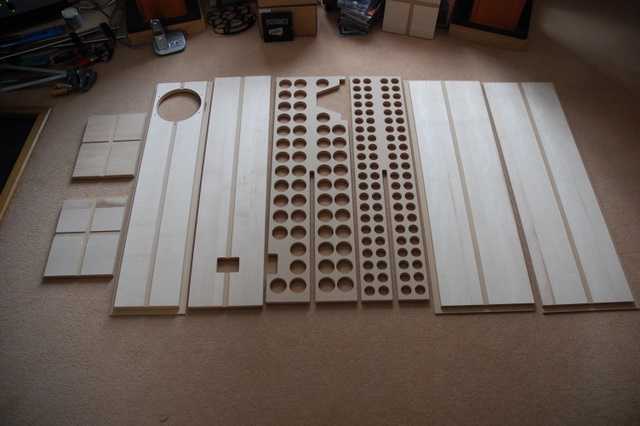 I decided to ask Wilmslow Audio in Leicester, UK, to make me a kit for the cabinets, so that I only needed to put them together, without the need for any sawing or routing. 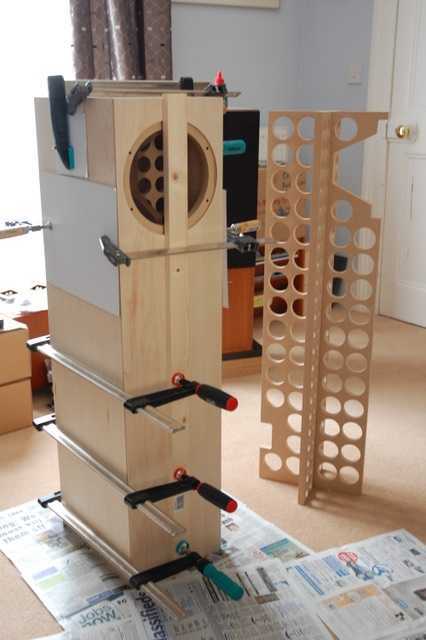 They were very happy to help and produced a great kit from which I was able to build a pair of excellent speakers. The only comment I have on the cabinets is that the construction method has the disadvantage that the corners aren't cosmetically perfect: there's a small strip of MDF on show at each corner as the veneered surfaces don't completely meet. I don't think this is a huge problem, but if you want your speakers to look perfect you will have to try a different solution. The construction is certainly solid and reliable, and everything fitted with perfect precision. I used the cabinet design that SEAS provided online. There were two good reasons for this. First, it was much easier than coming up with a new design myself, and second SEAS actually used identical enclosures to develop the drivers in, so they are more or less guaranteed to work well. 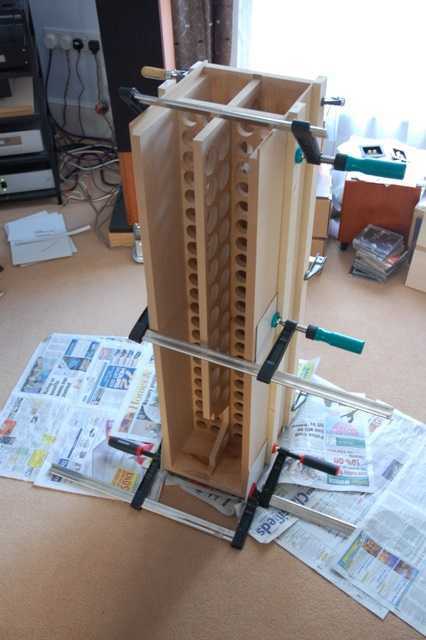 The design is for a 60 litre floorstander with extensive internal bracing. The only change I requested was a thicker front panel: 22mm instead of 18mm. For the rest the cabinets were made precisely as specified by SEAS. I added about 15 grams of wool per litre to the cabinets for damping, and this seemed OK to me, even if the bass was on the dry side. You could certainly experiment with less damping. 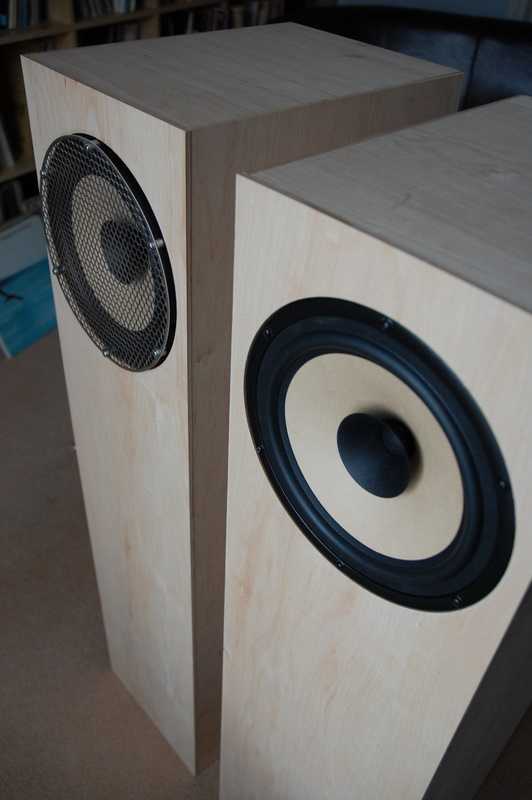 SEAS claim that these cabinets will give you a Q of about 0.8 without any damping at all, which is a good value. With my added damping I should now have about 0.7, which is generally considered to be close to optimal. One more thing that became obvious while working on the cabinets is the importance of suppressing internal reflections. Initially, I had only put in the wool to dampen the enclosure as a whole. But the speakers sounded shut in and the sound seemed to stick to them. I then covered the inside of the top of the cabinets with acoustic foam, to prevent reflections, and this cured the problem completely. The sound was now more open and refined with the soundstage almost completely disconnected from the cabinets. I was now experiencing the real acoustics of the recording, instead of listening to a pair of boxes. The spectral response curve for the Exotic drivers shows a clear imbalance: the top three octaves are tilted upwards and the reproduction without any measures to correct for this is therefore very much dominated by the higher frequencies. This is not unusual for such a design and has to do with the different cones responsible for the lower and higher frequencies, I assume. The solution is to use a simple filter, the design of which is provided by SEAS. It basically looks very much like a baffle-step filter and consists of an inductor and a resistor in parallel. This little circuit is then put in series with the speaker and corrects the imbalance of the driver. I used a 0.68 Jantzen ribbon inductor with a Mills 15 Ohm resistor. I initially used 12 Ohms ceramic resistors, but decided that reproduction was a bit too bright for my taste and changed them for the 15 Ohm resistors. Playing with these values will give you an opportunity to finetune the speakers to your taste. 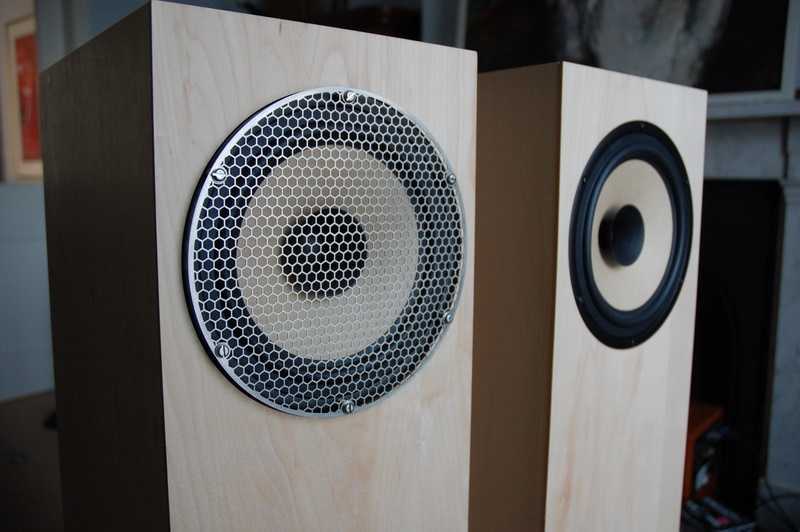 What you will prefer will also depend on how you place your speakers. When they are aimed at you directly there's more high frequencies than when they are pointing slightly away. I like to sit in the hot spot, with both of them firing almost straight at me, and I found a higher resistor value beneficial for this. The Exotic drivers feel extremely exposed when mounted in a cabinet. Especially the little whizzer cone feels very delicate and protrudes from the other cone in such a way that I feared for its safely, given the presence of two small children in my household. After considerable thought and some research I decided to have a pair of grilles manufactured specially for these two drivers. It was an expensive option, but the resulting peace of mind made it completely worth it. The grilles were laser cut from 0.9mm stainless steel by Cutting Technologies Ltd, Barnsley, UK. The cost was about £150 for the pair. One of the grilles isn't completely flat when mounted, which is caused by the heat involved in laser cutting and is difficult to prevent. Perhaps water-jet cutting would have been a better option. Still, I think they look quite good, and they are extremely effective too. I didn't hear any difference after mounting the grilles, in spite of them ringing a bit when I tap them with my finger. The Exotic F8 drivers have a nominal impedance of 8 ohms and a sensitivity of around 91 db/watt, which should make them a very easy load for the amplifier. They are also 'valve-friendly', something I will come back to later in this review. I really cannot imagine an amp that wouldn't be able to drive these speakers, as the sealed cabinets even make controlling the bass a doddle. The cabinets are rather big, though, so you will need a bit of space to accommodate them. The finished speakers are also quite heavy. I have to be honest here and tell you that the SEAS Exotic F8 speakers take a little bit of getting used to. They are definitely different from your usual speaker and first impressions can be that they sound a bit 'odd'. Bass is much dryer than with most ported speakers, and can sound a bit thin in comparison. But, their main qualities are also immediately clear: mostly an impressive transparency and immense precision, coupled to a great top-to-bottom consistency and fantastic dynamic expression. What also soon becomes obvious is that these speakers take no prisoners: they ruthlessly reveal the properties of the electronics upstream, and the recording especially. Bad recordings will sound bad, even if the music on them also comes through very strongly. These speakers refuse to prettify anything and just give it to you as it is. This is fantastic with good recordings, but can indeed induce some discomfort with lesser material. The thing is, these speakers are so engaging and honest that you soon forget to listen to your system and just focus on the performance. Once you start doing that, and you will, the fact that they are almost too revealing becomes irrelevant and you just enjoy the music. I did use them with a small subwoofer, but that is mostly to fill in a dip in the bass reproduction that is caused by my room. Bass simply sounds more even with the sub, and ever so slightly fuller, but was certainly adequate without it. If you like stronger bass from the Exotic drivers you could try less damping material than I used, or indeed combine them with a good subwoofer. The advantage of dry and well controlled bass is that it is easier to integrate with a sub, as the sub can now add what is missing while it can never take away what is wrongly added. The soundstage is impressive. Like with electrostats and most other panel speakers the instruments just appear behind the speakers as if they are actually there and the speakers have nothing to do with it. It's a classic disappearing act and it produces a realism and directness that immediately brings you to the performance, virtually cutting out the system. When you focus on it you can still hear a system working, of course, partly because the Exotics are so revealing of the electronics feeding them, but also because these speakers are certainly not perfect. They have their limitations, but with a good recording they make you forget about those and bring a sense of occasion that doesn't wear off, even after months. I don't always feel like listening to music but the Exotics have that ability to keep you listening for the whole evening, even if you initially had to force yourself into it. One thing that really helps with this is the fact that every recording sounds different, due to a lack of added personality and colour by the SEAS drivers. This means that they are uncannily able to reproduce the specific atmosphere of a performance and bring you to a different environment with every disc. The flip side of this honesty and transparency is that recordings that rely on a bit of extra warmth or support from the system can now sound somewhat stark and uninspiring. Specifically processed pop music suffers from this. Another point is that these speakers are very sensitive to being played at the right volume. Too low and they sound a bit thin, too high and they start to lose their refinement. You also need to make sure that the volume is consistent with the actual performance: a full orchestra doesn't sound convincing at a low volume, and the Exotic drivers make this extra clear. Going back to my own Dynaudio Contour 1.8 mk2 speakers after a while was a shocking experience. Their bass sounds quite boxy and over the top compared to the SEAS. They also sound a lot softer and less alive, almost boring in fact. It really took me about an hour to get used to my own speakers again, and then I was still missing a lot of things the SEAS are doing so well, like micro dynamics, precision and rhythm. Compared to the life-like dynamics of the Exotics most multi-way speakers sound a little bit blunted, so I cannot blame it on the Dynaudio's, but the difference was much bigger than I expected. The Dynaudios are more forgiving of less than optimal recordings, but they also disappoint with really good recordings, mostly because of their lack of control in the bass. And I'm using them with socks in the ports! I do have to admit that some of these problems are caused by my listening room, which is too small and too square for really good bass reproduction. Still, the SEAS were doing a much, much better job, albeit with the help of that small subwoofer. I also took the Exotics to a friend, to be able to hear them in a different system and room. My friend's room is much bigger than mine, and also is acoustically better. His system is all Naim and his own loudspeakers are the famous Living Voice Avatar OBX, which should provide stiff competition for the SEAS. In spite of a different system, and a very different room, the effect of replacing the Living Voice speakers with the SEAS and then going back to the LV's a few days later was quite comparable to my experiences with my Dynaudios. Of course, the Living Voice speakers are much better and are sitting in a room that really suits them, so the bass problems I have in my room weren't happening here. But the SEAS still showed their midrange qualities and their control and precision overall. Voices were delicious and piano a treat. The only real downside was that the bass wasn't strong enough for the room, and we didn't have the time to adjust my friend's subwoofer to the SEAS. This was a shame, as a good strong bass underpinning would have worked really well with the sound that the Exotics were producing in my friend's room. Compared to the brilliant Scan Speak Revelator tweeters in the Living voice speakers, the top end of the SEAS did lack a bit of sparkle, but to be honest this didn't really bother me. Going back to the Avatars after extensive exposure to the SEAS was an experience that reminded me of the contrast with my own Dynaudios: compared to the SEAS Exotic other, 'normal', speakers do sound a bit soft, slightly inconsistent over the frequency range and a little bit lumpy in the bass range. I do have to admit that I would still prefer the Living Voice speakers to the SEAS ones, if only because they are easier to live with. But I would still be missing the SEAS, no doubt about it. One of our friends described the SEAS as being a bit like a Harley Davidson motorbike: very very good at a few things, but you would want to have one or two other bikes next to it for the other things. As part of my investigation I thought I'd also try these speakers with valve amplification. That is their natural partner, after all. The fact is, however, that I had never before used valve amplification in my system. The reviews will follow, but I can already tell you that I soon regretted not trying valves earlier, as I very much liked what I heard. These speakers indeed work very well with valves. The first amp I tried was the Icon Audio Stereo 40 mk3, an integrated push-pull amplifier using KT88 valves and rated at 40 watts. The clearest difference was in the bass, which was now fuller and warmer. This could be the case because I perhaps overstuffed the cabinets a little bit, making them slightly too dry in the bass. The lower damping factor of the valve amp nicely compensates for that and the overall balance was now spot on. 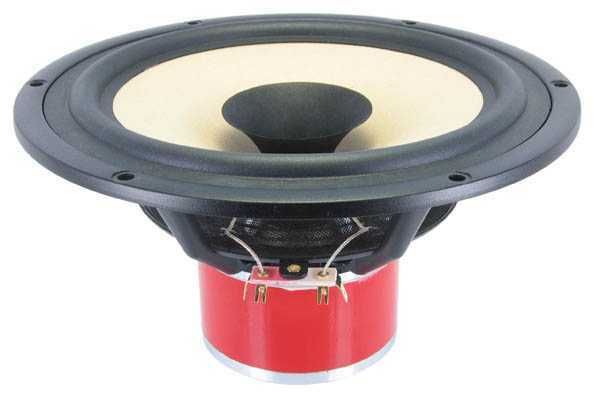 The midrange benefitted too from the typical valve richness which is extremely welcome with a speaker like this. Even the top end now seems a bit more open and gained some clarity. Especially piano now sounds better in the higher registers, with a more natural tone and a more dynamic and sparkling sound. All in all I think this speaker really should be used with a good valve amp, and the Stereo 40 seems the perfect partner. Then I was also able to borrow a 300B single ended triode amp from Mike Cox, our new reviewer. This worked even better in many respects, but was lacking somewhat in other areas. The sound is now even warmer and richer, which is welcome, but the top end is positively muted. On the other hand, and to my surprise, the dynamic qualities of the midrange and top end seems to be even better than with the Icon Audio and this 8 watt amplifier even works quite well at relatively high volumes. It does feel like a step back in time, to drive a single driver speaker with a 300B SET amp, but there's no denying that it works and that the famous valve magic is present in spades! The move from transistor amplification, my Usher R1.5 to be precise, to valves made these speakers even more competitive with normal speakers, I have to say. During the review period I also had a pair of PMC speakers available, and the SEAS had no trouble beating them on musicality, even if the PMC speakers scored higher on virtually every hifi parameter. The combination with the Icon Audio Stereo 40 mk3 is fantastic and actually exceeds my expectations of what was possible in my room. In that light, all my earlier experiences with transistor amps aren't really relevant anymore, even if the Exotics did actually perform rather well with them. Switch to a valve amp, however, and you can experience something really special. The transparency, musicality, tonal purity, warmth and engagement that this paring will produce is exceptional and very addictive. The best amplifier and speaker combination I've had in my system, and by a long way at that. In summary I can say that these speakers aren't the easiest to live with, but they can be hugely rewarding at times. When used with valve amplification they really come into their own and produced the best sound I've ever had coming from my system. Their main qualities are musicality and coherence, and compared to these speakers most other 'multi-way' speakers sound mechanical and artificial. Another definite talent is the transparency of the midrange and virtually everything else sounds somewhat muted in the middle frequencies in comparison. In combination these two properties make voices sound amazing: very natural and very real. Bass is equally good, very precise but less strong than with ported speakers. I found that a small sub really helps, but you might want to also put less damping in yours than I did, unless you are using valve amplification. The only things that are a bit less that average for this price range are the top end and the maximum volume. Both aren't bad, but most speakers will have a bit more spark at the top and will go louder. The treble is fine when the speakers are aimed straight at you, but much less strong when toed out or in. This also means that the hot spot for listening is rather small: these are single person speakers, really. It also means that the off axis response lacks the upper frequencies, making for a less than optimal dispersion. Because of this these are more 'you are there' speakers rather than 'they are in your room' ones, if you get the idea. Perhaps the best thing about these speakers is the way they make you focus on the music. When you hear musicians perform live, you're not going to ask yourself how deep the bass is, or how transparent the midrange, how crisp the treble, are you? These speakers do the same thing. Who is going to worry about hifi parameters when you can almost see that double bass right in front of you? And, just like with the real thing, you might want to hear the performer in a better acoustic, or from a better seat. But that is the point: you're still hearing a performance, not a reproduction. Whatever they do wrong, the things they do right make you forget about the errors. In the end, what fascinates me most about these drivers is not just how well they sound, and how coherent and musical they are, but also the fact that they prove that there's not one single solution to building a good loudspeaker. They are distinctly different to most other speakers in the market, but just as valid and enjoyable as a tool to bring music to life. They've not only entertained me, they have also thought me something, and changed my perspective on audio. They've even led me to valve amplifiers, and in combination these two ancient technologies have brought new life to my hobby and made me appreciate music more than ever. A loudspeaker cannot do much more than that. Highly recommended, especially with valve amplification.